Well, obviously, such a project is going to be very complex when it comes to the audio infrastructure. All possible solutions were evaluated, but in the end it was decided that creating an IP Audio network, using the Audinate Dante protocol, would be the ideal solution. We can only agree. Yet, we agree even more that the ideal central audio-routing hub should be an AX32 unit. The idea behind this concept was to give the 91% of all artists, who largely remain unknown to the mainstream audience, a fighting chance. They simply felt that way too much great music is passing by without anyone really noticing. And that is unheard of! Therefore, they decided to name the mobile studio 'Unheard'. 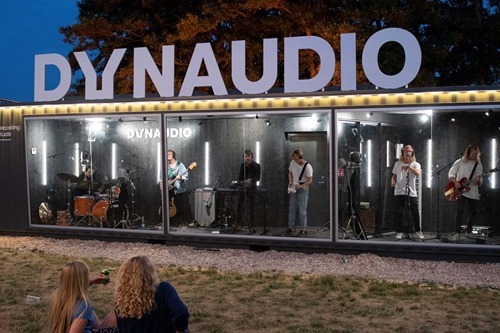 Dynaudio Pro's vision is to let these relatively unknown artist use the Unheard studio - and they even hired a professional producer and engineer to help the bands track and mix their sessions. Now, on the technical side, there are so many aspects. Because, setting up a fully-fledged recording studio in two cargo containers was just the beginning. Also part of the concept is up to six camera angles and a complete team of video staff to capture and edit the visual side of things. And, since this is happening at a music festival, the live audience outside the container needs to be able to hear what's going on as well, which means that a PA system is rigged to roof of the container. In other words, there are a lot of audio streams at play here. 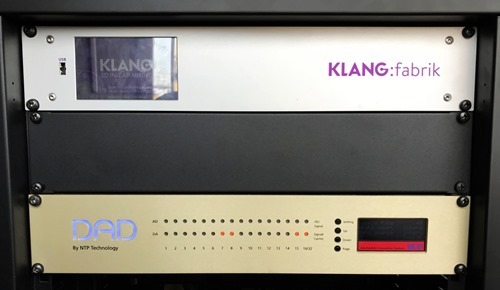 Luckily, the AX32 unit located in the live recording room is perfectly happy to distribute and convert between signals, including Dante, MADI, AES and Analog. Oh, and to top it off, a MOM monitor controller is also connected to the AoIP network to give the producer hands-on control and comfort. Of course, there are many more aspects and details to this setup, but don't worry, we are working on an in-depth case study on the Unheard mobile studio that we will share with you soon.